The Twa are a pygmy people who were the original inhabitants of the Great Lakes region of central Africa. 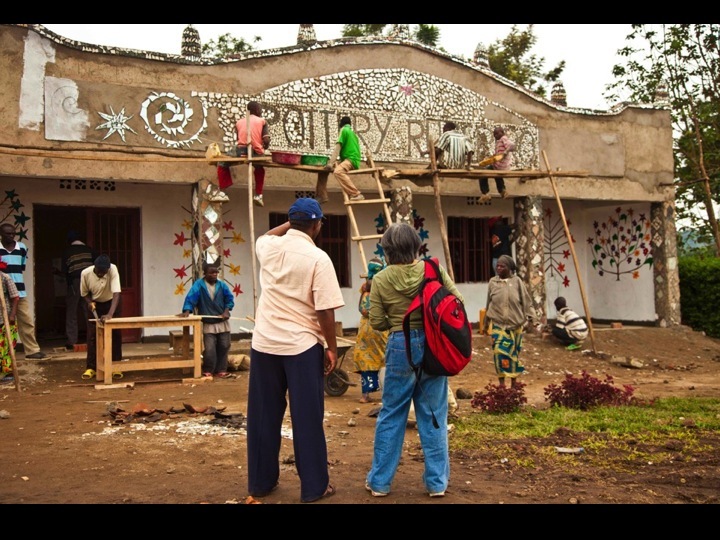 Moved by their talent, energy, and desperate situation, Barefoot Artists began assisting the Twa in 2009 through a goat project. 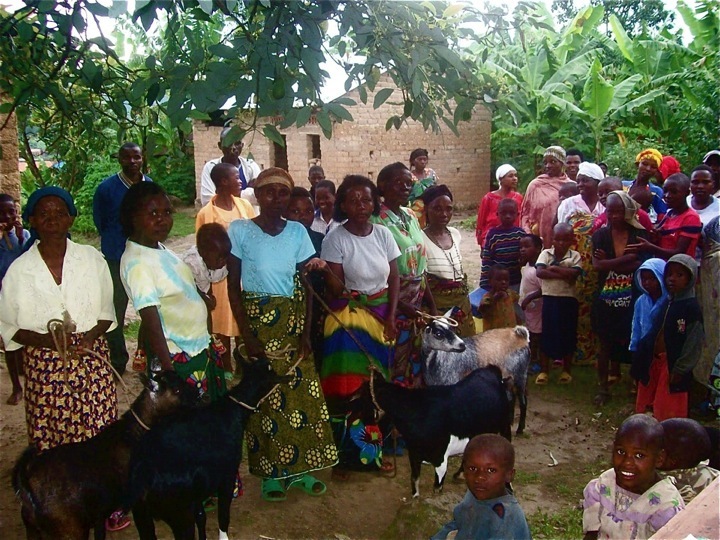 At the beginning, only half of the village families were given goats. Goats multiplied. 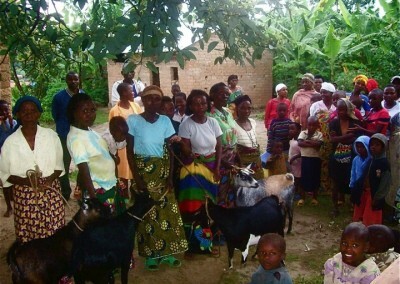 Within a few months, the other half of the families received goats too. This way, no one sold or ate the goat for a short term gain. 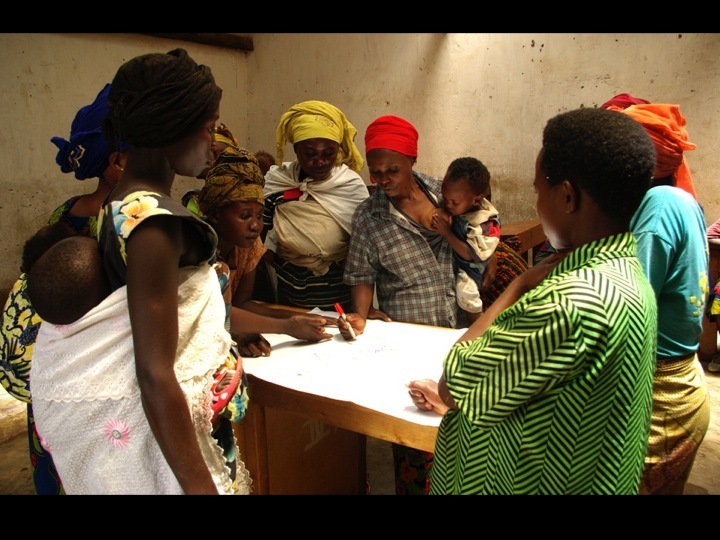 This was the first step in organizing the community and encouraging them to think of their future and to generate assets. The Twa people have been scattered throughout the region. 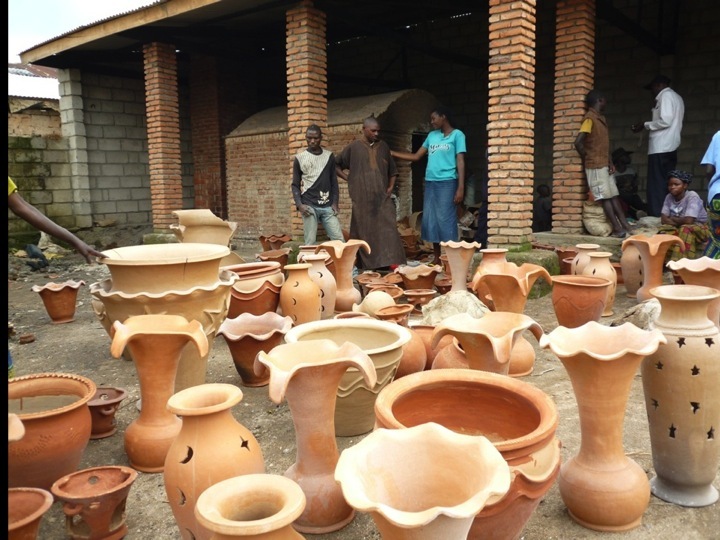 Most of them make pottery to earn a living. Due to the lack of resources, they fired their pots in the most primitive manner – with assorted tree leaves in the open air. Their products sold for pittance. They asked for help to build an art house where their work could be properly displayed and better priced. 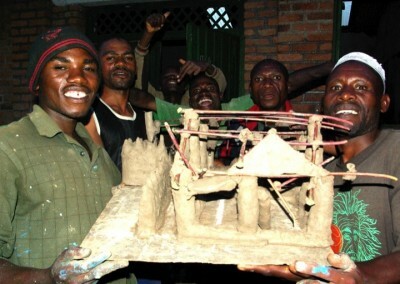 Barefoot Artists organized a series of workshops where men, women, and children were encouraged to design the art house. 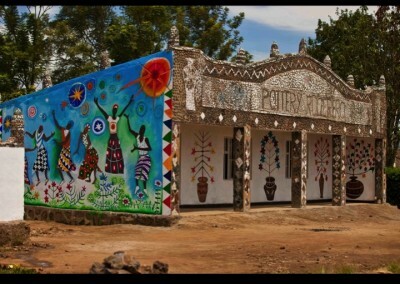 Through the process, their dream for one art house expanded into the desire for a community art center containing a communal workspace, a large kiln, a storage room, an exhibition space, a shower, and a toilet in a spacious compound. Responding to their request, Barefoot Artists acquired a piece of land for them, where they could erect the communal art center. 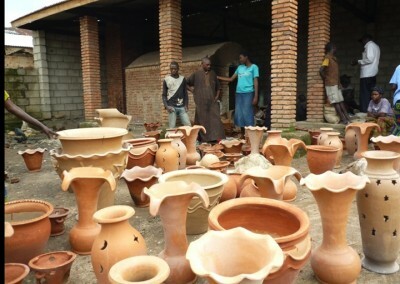 It would be a place where the whole community could work together and fire their pottery in a well-built communal kiln. 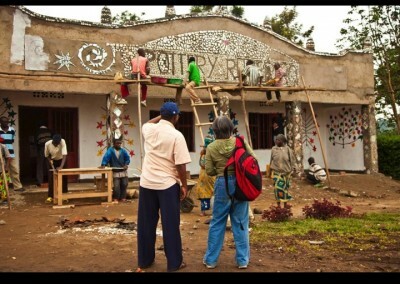 The community mobilized, men, women, and children, to build their art center. Artist Lily Yeh guided them in mural painting and mosaic making. The beauty and uniqueness of the new art center now attracts visitors. The Twa are now producing high quality wares, and selling them at four times the price of their old wares. Insufficient food supply had been an on-going problem with the Twa. Although they are good farmers, they had no land. They were lending themselves out to farm for other people. 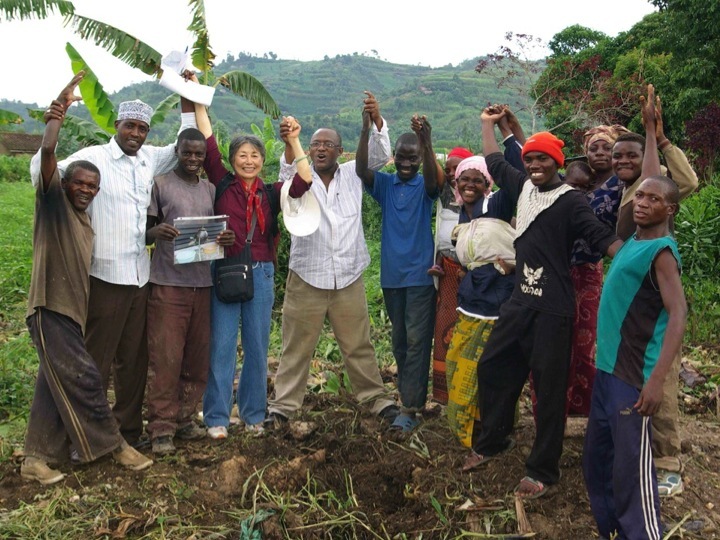 During our visit in 2010, Barefoot Artists succeeded in acquiring a piece of farmland for the Twa. They now have increased self-sufficiency in their food supply. The Twa are natural dancers. 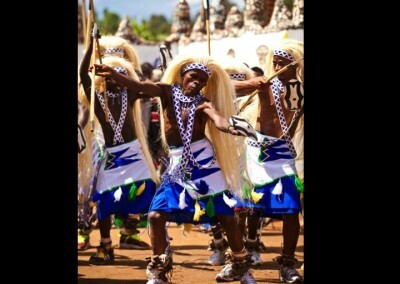 They readily express their emotions through dance and songs. 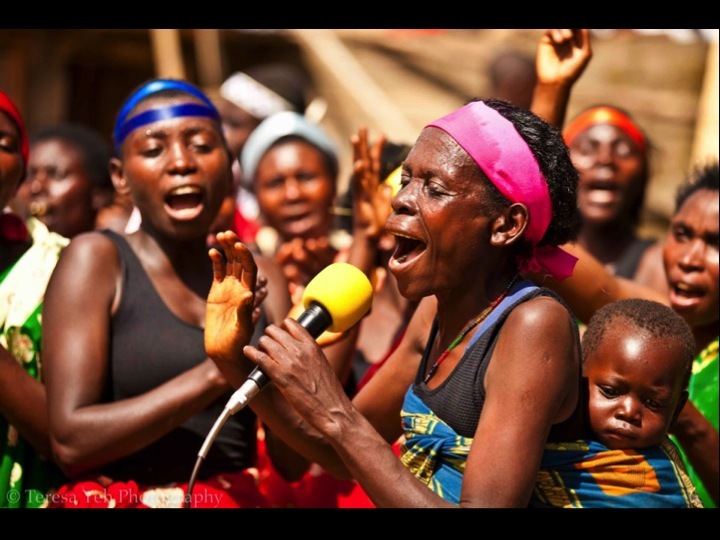 Often, during our workshops, they would spontaneously break into song and dance. When they are happy, they dance with terrific energy and abandon. 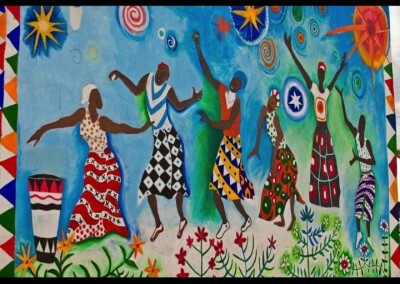 In the spring of 2011, Barefoot Artists collaborated with the University of Florida’s Center for the Arts in Healthcare to equip the Twa with training, costumes and musical instruments to help to establish them as professional performers. 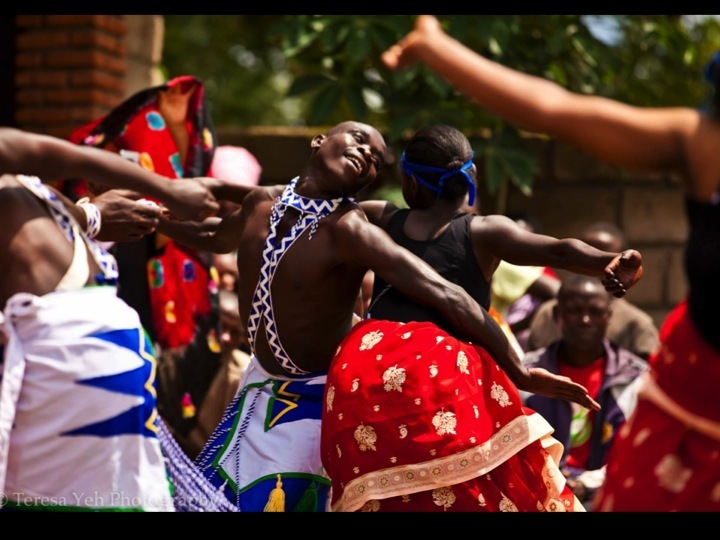 The forty-plus members named their team “Amahoro Dance Troupe.” Amahoro means peace in Kinyarwande, the Rwandan language. The Troupe gave its first professional performance at the East-Central Africa Arts & Health International Forum in Kigali on May 13th, 2011. 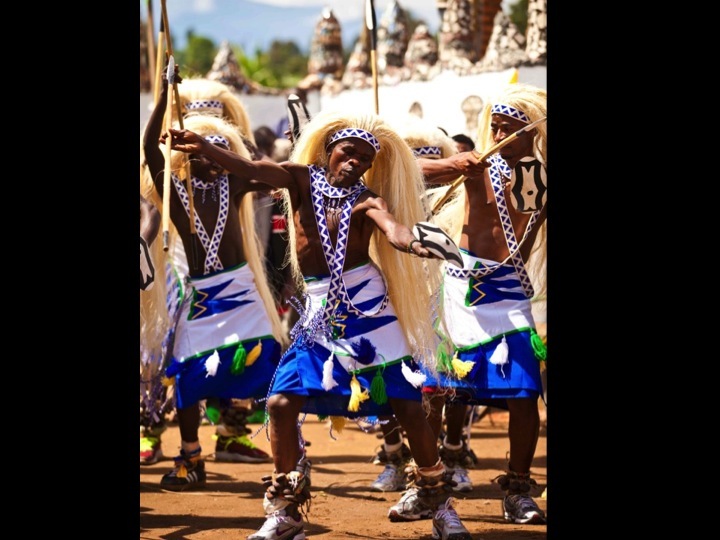 For many of the dancers and musicians, the four-hour trip to Kigali was their first ever in a motor vehicle. What a huge milestone in their lives! “There is a big change in their attitude toward themselves and their sense of the future. 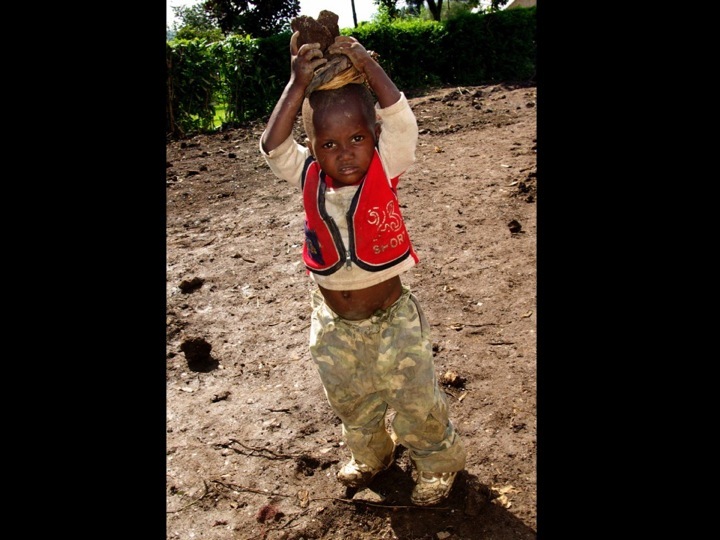 They are now hopeful and proud,” commented Jean Bosco Musana, Barefoot Artists Rwandan Program Coordinator. 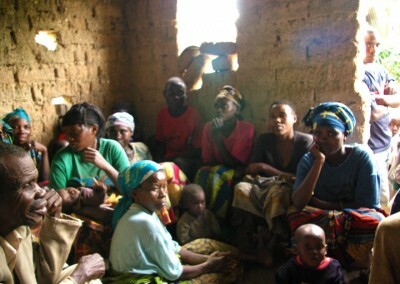 Twa people are at the bottom strata of Rwandan society. They live in adobe homes constructed by their own hands. They have been denied of resources for generations so they worked with soil and became wonderful potters. 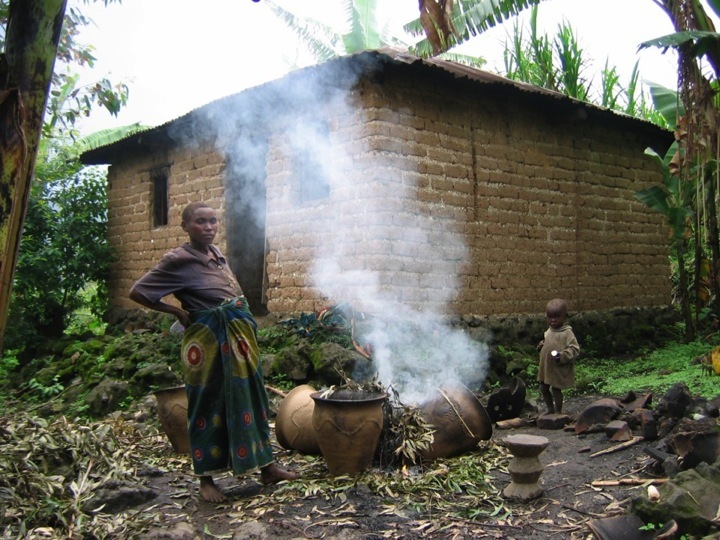 They had no money to purchase wood, so they used whatever plant materials they could gather, mostly leaves and twigs, to fire their pots. They lived in dire poverty for their wares sold for only triflings. Our first community meeting indoors. 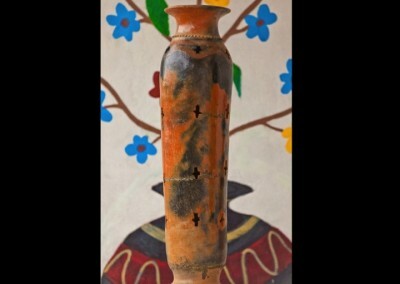 Yeh shared an image of a water container that might become popular in the market because most of the homes have no running water. 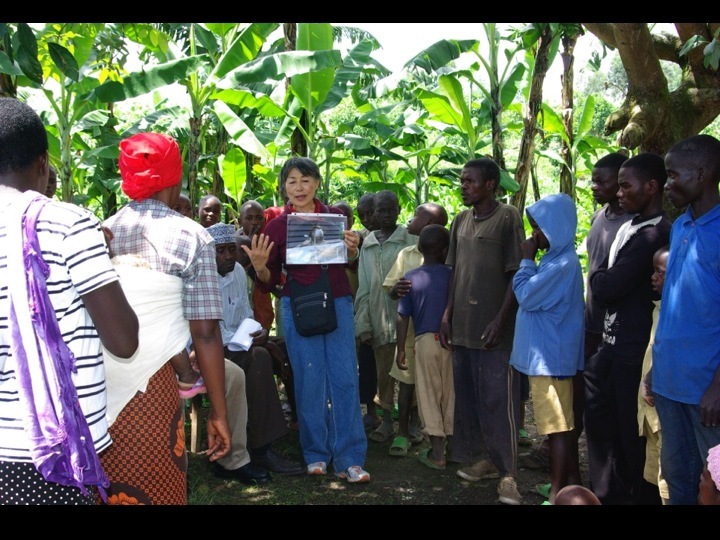 Create resources through a goat rearing project. Holding our hands together, we celebrated the acquiring of the land. It belongs to the Twa villagers. In the center is Jean Bosco Musana, our program coordinator. We are deeply grateful for his wisdom and guidance. Never too early to start. The proud little two-year-old is doing his share. 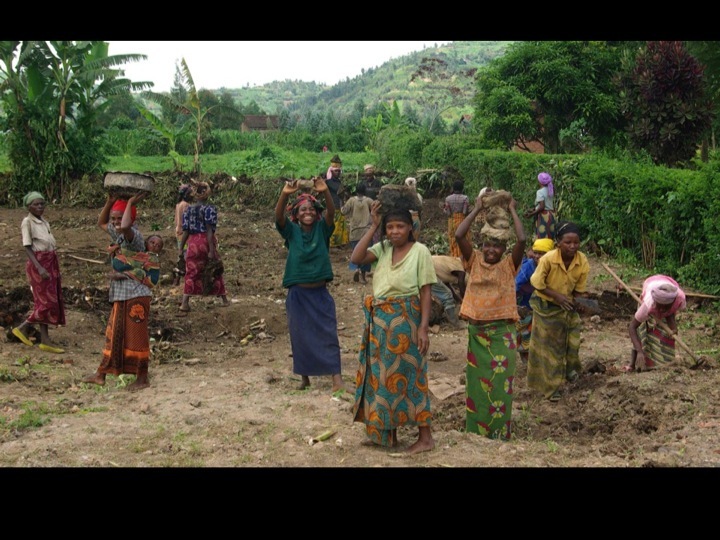 The villagers have worked hard to have the ground cleared. What to build? We held community design workshops. 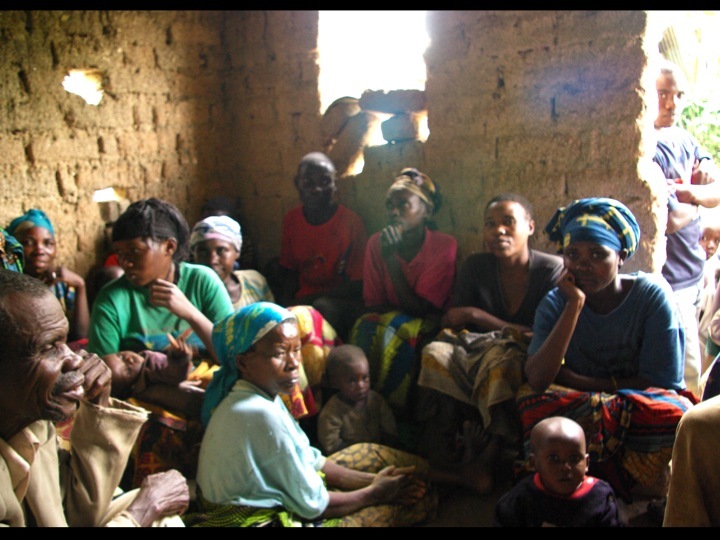 We divided the villagers into three groups, men, women, and children. 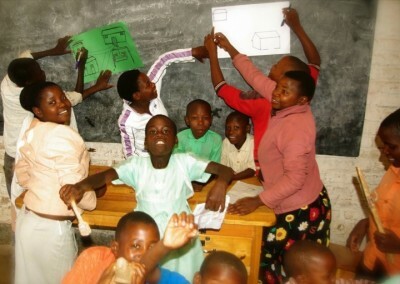 Each group has equal opportunity to express its aspirations. 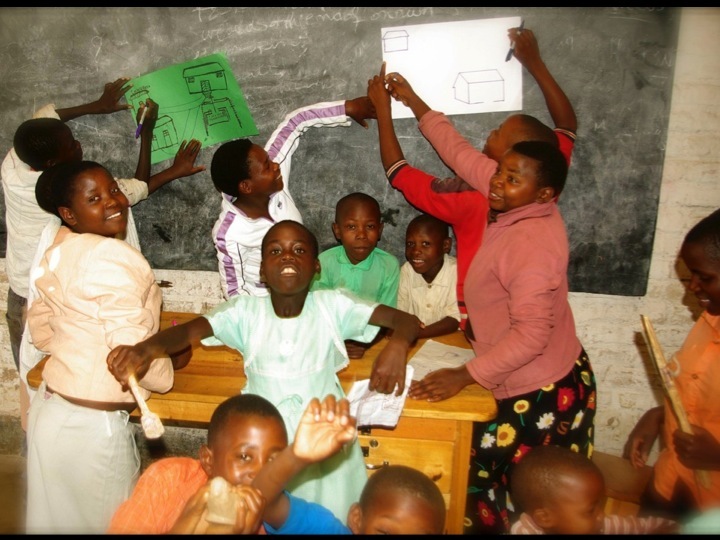 Children were ecstatic when they were invited to design and present. 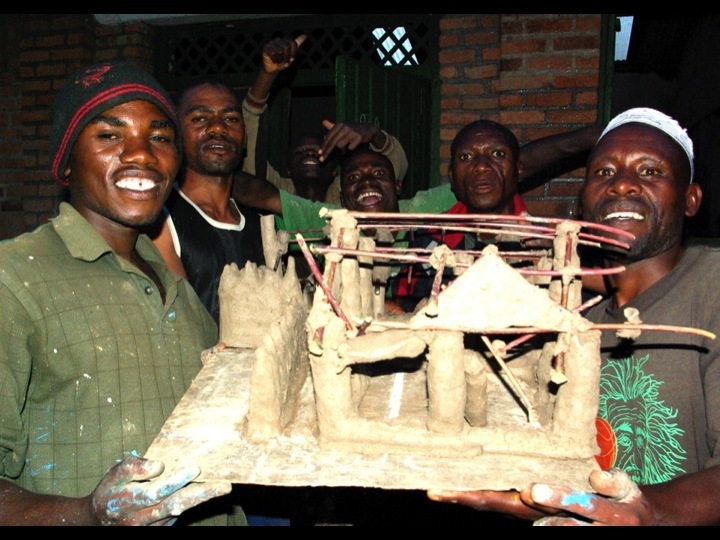 The Twa men, the dominant group in the village, proudly carried their 3-D model of the art complex to the community meeting. At the forefront, the ample communal work space included a large wood-fueled walk-in kiln. 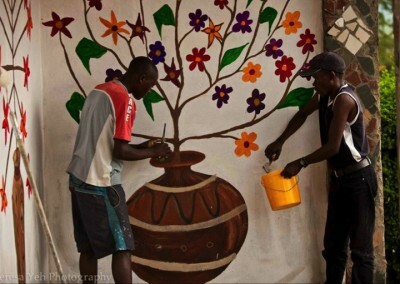 Making a mosaic sign – Pottery Rugerero. 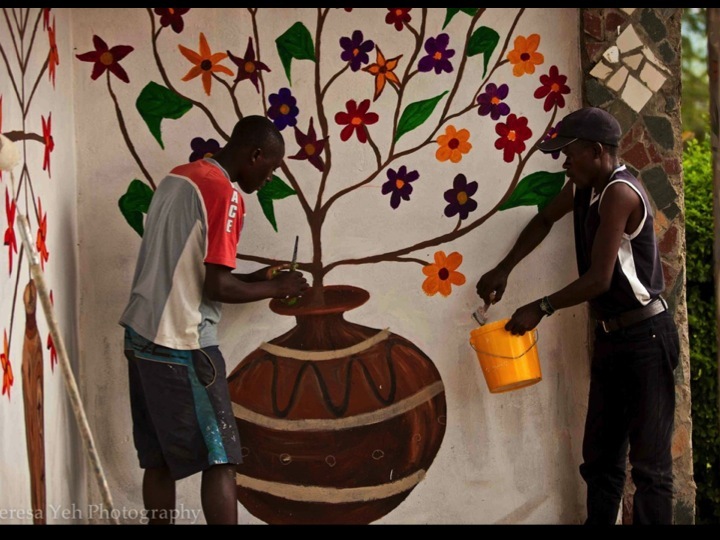 Decorating the wall with their own design – the flowering tree coming out of a large Twa pot. 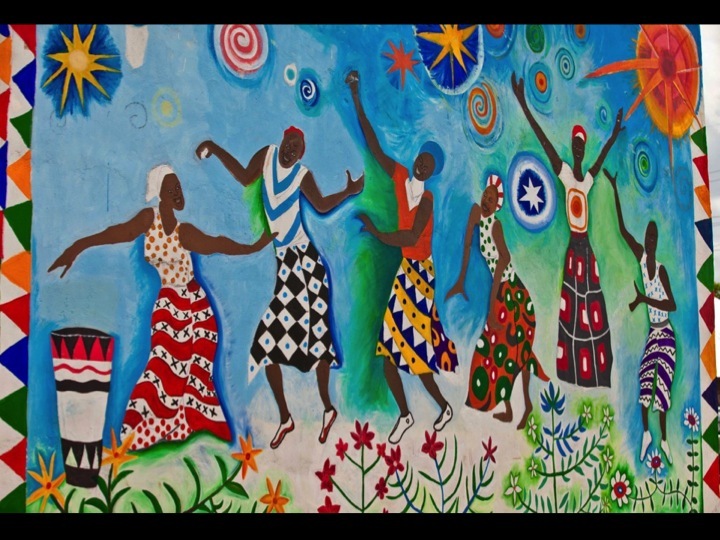 The completed mural with dancers and a drum. 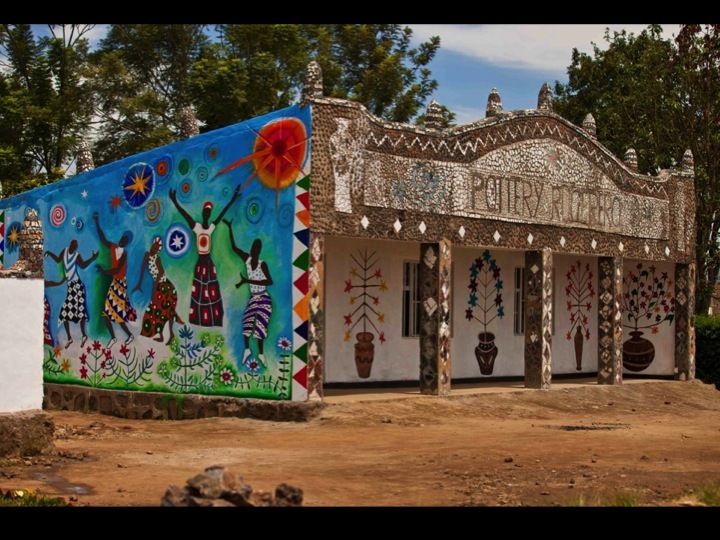 The completed Pottery Rugerero, not perfect in the mosaic work and other details, but jubilant and unique in its design and beauty. Large pots drying in the open courtyard. Celebrating the dedication of the Twa Pottery Rugerero, the male dancers performed the traditional hunting dance. 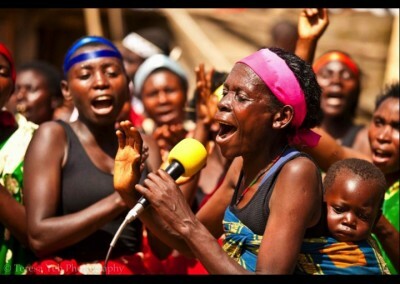 Supported by the chorus, a Twa deva is singing her heart out.